I had expected to love the Dolomites – they are a hikers paradise after all – but what I hadn’t anticipated was that I would spend the few months after I left prattling away to anyone who would listen that this spectacular corner of Europe should absolutely be the next place they visit. Arriving late in the season, when the mountain air was laced with the first chill of autumn and vibrant earthy tones had begun to crinkle through the forest leaves, I was met with impossibly beautiful landscapes of golden meadows and row upon row of jagged peaks that carved up the horizon. I spent an entire week hiking between the stark mountains and blushing forests of the Dolomites, eagerly devouring every place on foot. 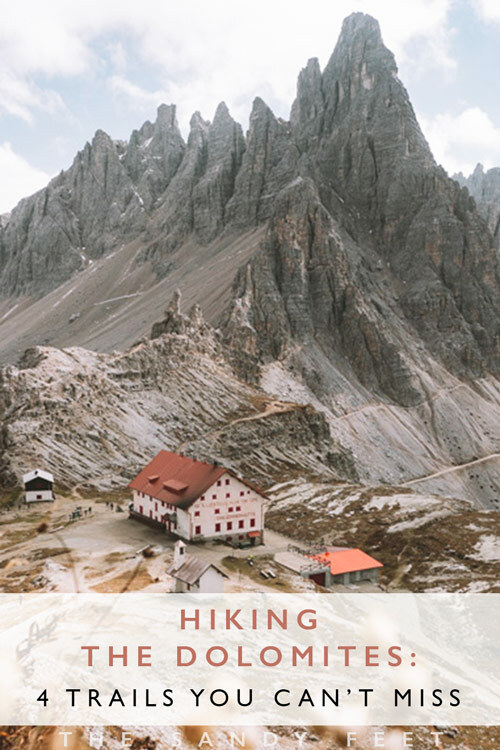 and while there are dozens of incredible trails waiting to be explored, these were my four favourite hikes in the Dolomites. With so much beauty to be found elsewhere in the Dolomites, Lago di Sorapis may not fall on everyone’s Dolomites to-do list, but with its milky blue hue and dramatic backdrop of imposing cliffs, it really should. Starting from the Passo Tre Croci parking lot, the hike involves a delightful ramble through the forest before hugging the cliff’s edge which leads to the mesmerising blue pool of Lago di Sorapis. 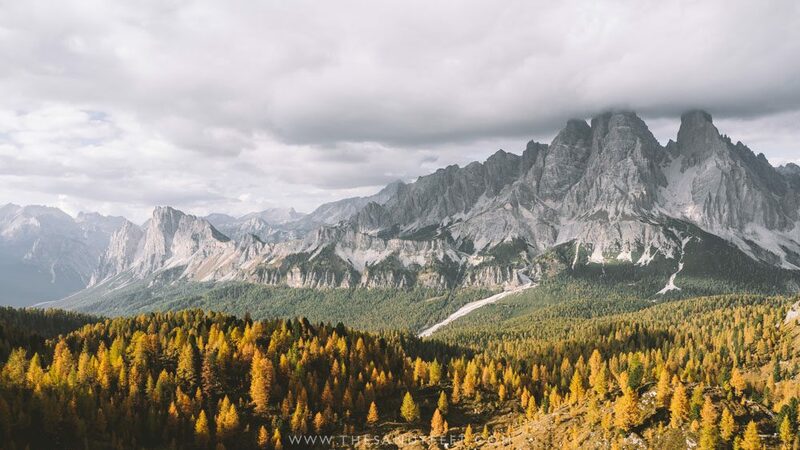 Those content with an easy half-day hike can return via the same route, while avid hikers should certainly consider taking the far more challenging trail which leads back to Cortina. This alternate route climbs toward a windswept mountain pass where the wide landscapes unfold beneath your feet and a wall of stark mountain peaks marks the horizon. It’s a hike that sees very few visitors but offers up some of the best views of any Dolomites hiking trail. The Hike | 11 km return via the standard route, or 18 km via the challenging alternate route to Cortina. Get There | Drive or take the bus from the central bus station in Cortina d’Ampezzo to Passo Tre Croci to begin the hike to Lago di Sorapis. Either return via the same route or follow the alternate route all the way to Cortina. Few spots are more iconic to the Dolomites than Tre Cime Di Lavaredo. It’s a place that adorns postcards throughout the region, inspires visitors from across the continent and is often the number one stop for excited hikers laying foot in these mountains for the very first time. 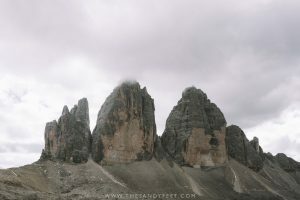 And its popularity is certainly warranted, Tre Cime di Lavaredo is absolutely one of the best hikes in the Dolomites. The hike itself is relatively straightforward following a mostly flat, clearly marked trail in a loop around the three peaks. 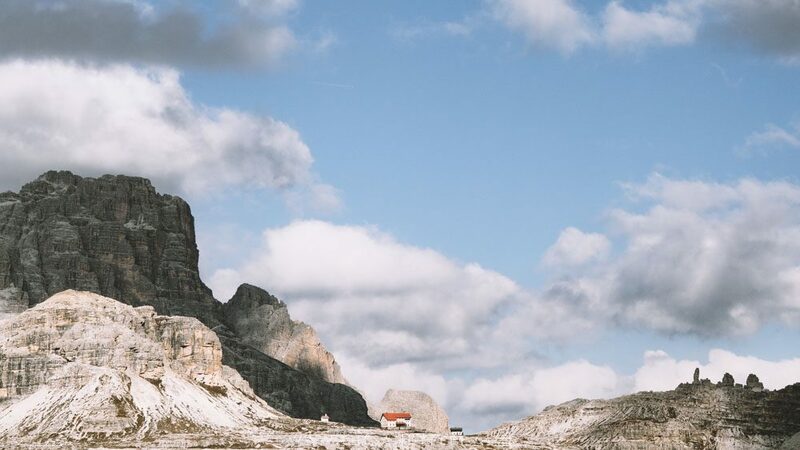 The perfectly located Rifugio Locatelli or Dreizinnenhütte gazes directly onto the impressive trio of rock and backs onto a picturesque scene of golden meadows, turquoise lakes and a spectacular mountain backdrop. The Hike | Online guides recommend around 3 to 4 hours to complete the 11 km hike, but if you’re anything like me, you’ll want to set aside all day to explore the area. Get There | Drive or take the bus from Dobbiaco or Cortina to Rifugio Auronzo where the hike begins. Driving attracts a €30 road toll as well as parking fee. 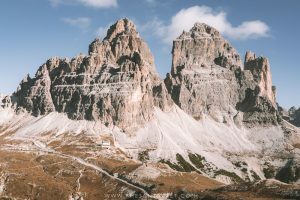 Along with Tre Cime di Lavaredo, Seceda is one of the Dolomites most recognisable sights – a series of razor-sharp spikes dressed in a velvety blanket of grass that tumbles toward the wide valley of Val Gardena sprawling into the distance. Despite seeing it dozens of times online, visiting in person is nothing short of spectacular. Starting from such a height, Seceda makes an excellent jump off point for a day hike as the only way to go is down. The hike to Wolkenstein traces the gentle folds of the landscape, past charming log cabins and crystalline lakes, beneath uneven rock falls and through densely packed forests until suddenly you emerge at the backstreets of the village. On the way, you’ll pass a number of rifugios, like Troier and Pieralongia, but stick to the higher trail and eventually the valley will funnel you toward my favourite spot, Rifugio Firenze or Regensburger Hütte which offers beautiful views over the mountains and has a good selection of snacks and drinks. 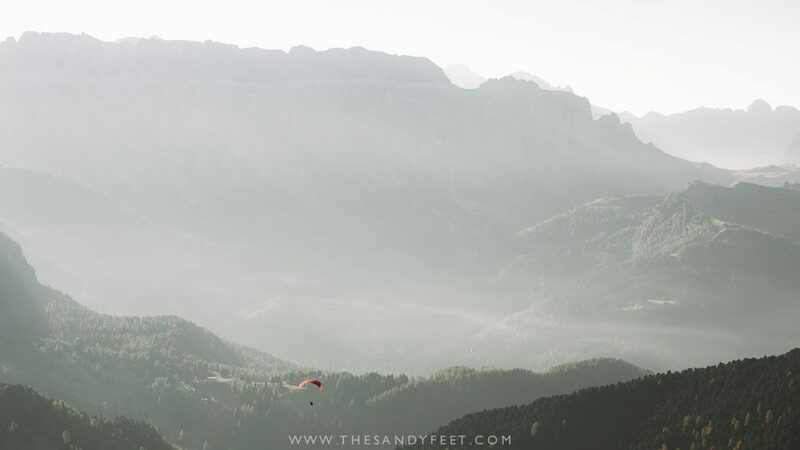 If the wind is right, you might also be in for a real treat as dozens of paragliders take to the sky, gliding and twirling gracefully above the dagger-like spires. Get There | Take the cable car from Ortisei to Seceda (€22 one way) to begin the hike, and to return, take any of the regular buses that run between Wolkenstein-Nivesplatz (referred to as Selva di Val Gardena in Italian) and Ortisei, costing €1.50 or free with Val Gardena Mobil Card. Alpe di Siusi pretty much epitomises that quintessential alpine scene. Rolling golden hillsides – or juicy green if you’re here in spring or summer – dotted with cute cabins that’ll make you want to move right in. The impressive rocky massif that rises from the lush grasslands amidst a sea of trees also makes for a spectacular backdrop to the many hiking trails in the area. 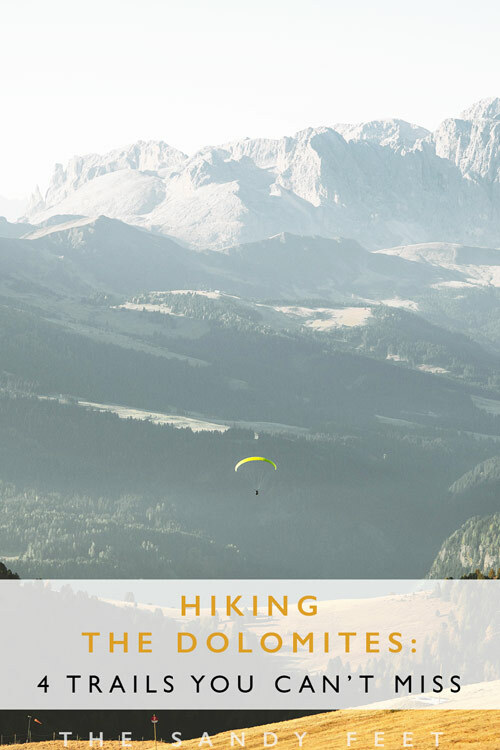 As the largest alpine plateau in Europe, Alpe di Siusi is perfect for those looking for a more relaxed hiking experience, without the calf-burning hills and rocky scrambles of some of the other hikes on this list. 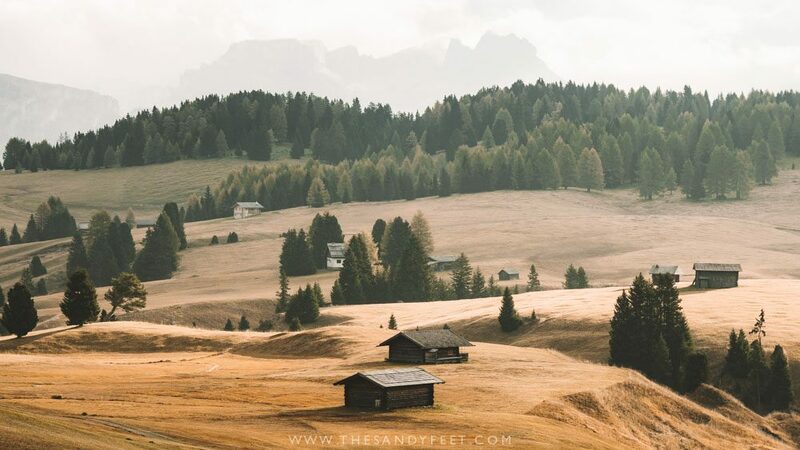 For most visitors, mention Alpe di Siusi and they’ll most likely be imagining the Insta-famous shot of three delightfully cute cabins dotted around the meadow with the jagged cliff face looming in the distance. Confusingly though, when you type Alpe di Siusi into Google Maps, it’ll drop you somewhere near Plan de Gralba which is not at all correct. Instead, you’ll want to be near the Adler Lodge at the upper Ortisei – Seiser Alm cable car station. If you’re arriving by car, park in the large parking lot in Compatsch beside the Information Centre from where it’s about a 4 km hike. The tiny roads that weave across the pastures are not publicly accessible by car and you can be heavily fined for trespassing. Otherwise take the cable car up directly from Ortisei to begin your hike. The plateau has dozens of hikes on offer depending on how far you wish to go. Heading to the Dolomites? Start planning your adventure with these helpful guides.